I’m flying through empty products like its no ones business this year. I haven’t featured them all on my blog purely because I don’t want to inundate you all with empty products so I’ve been reserving my absolute favourites and my hates for these kinds of blog posts. Earlier this year, I took up a challenge from Neal and Wolf to try out their Ritual Daily Cleansing Shampoo and Daily Conditioner to see how well they worked with my hair. I’ve used a few sample sachets of this duo before and enjoyed them however I would never judge a product after only using a sample sachet as I thoroughly believe that you have to continuously use a hair product in order to see the full results. I am pleased to say that this duo only got better with using the full size over the sample sachets. The Daily Cleansing Shampoo is suitable for all hair types, as is the conditioner and they both smell incredible, as though they have a hint of musk and the scent lingers on the hair after it is dried. I LOVE it. The shampoo cleaned my hair thoroughly without stripping it like a clarifying shampoo, making it perfect for daily use as it doesn’t encourage colour to fade from the hair and it doesn’t dry it out. I have very oily hair and found that this shampoo didn’t make it any more oily than usual and I was able to use the conditioner all over my hair rather than just on the mid lengths and ends and again, it didn’t make my hair greasy at all. This duo left my hair looking and feeling super healthy and with a natural sheen. I also found that my hair was very easy to comb through and brush after using these. If you look at any of my outfit photos for February and March, this is the shampoo that I have used on my hair. 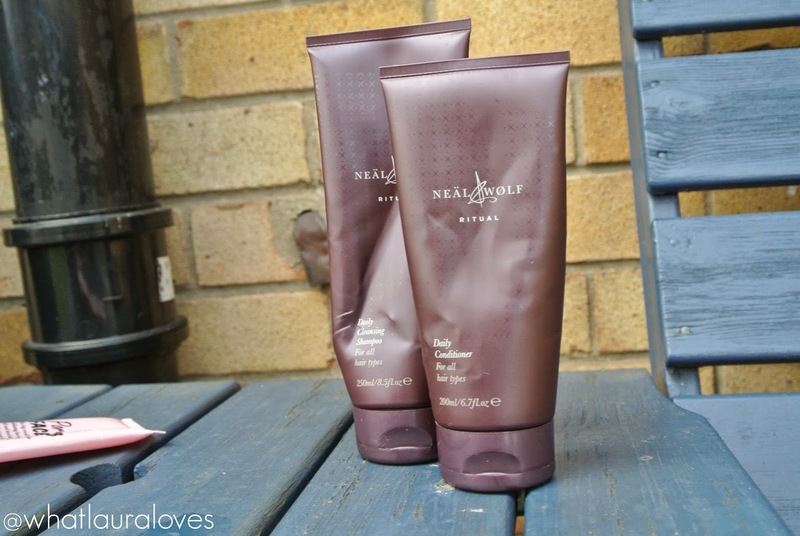 These products are available to buy direct from the Neal and Wolf website or you can buy them from Beauty Bay where the shampoo is a little cheaper at £7.61 here and the conditioner is cheaper than the retail price at £8.08 here. I use the Neal and Wolf blow dry balm and always buy it from Beauty Bay as their prices are low and they offer free delivery. Moving on from two products I loved to one that I thought was absolutely useless and that’s the Roots Hair Treatment, £9.95 from Lush. I love Lush products like their bubble bars and bath ballistics however so far, I am yet to find a hair product that I like. The Roots Hair Treatment is a thick scalp mask that uses mint to stimulate the scalp and the hair follicles. It also includes conditioning and strengthening ingredients like extra virgin olive oil and honey. To use it, you massage it into the scalp, leave it for 20 minutes and then wash it out. The mask feels lovely and cooling, very awakening however I found the mask to be too thick for my long hair and I found it incredibly difficult to wash out. It seemed to cling to my hair and I couldn’t seem to wash my hair clean afterwards. Perhaps this would work better in shorter hair, perhaps in mens hair too but it wasn’t for me and I wouldn’t repurchase it. A hair masque that I enjoyed using a little more than the Lush one is the Macadamia Natural Oil Deep Repair Masque which I reviewed in full here. 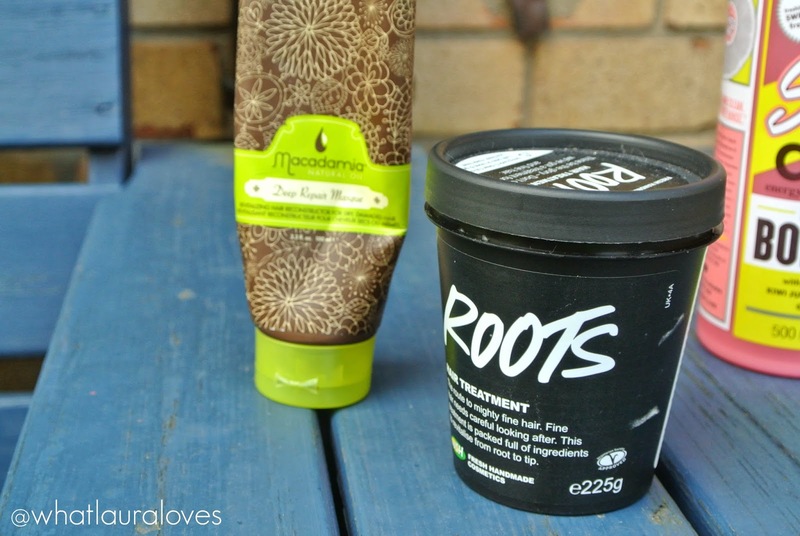 I love this intensive hair mask and would definitely repurchase it. You can buy it from Look Fantastic. 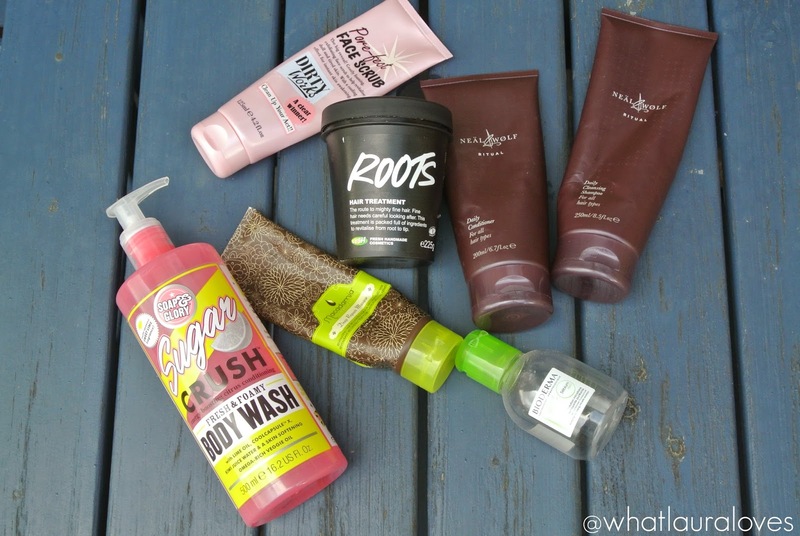 The Soap and Glory Sugar Crush Body Wash is one of my favourite all time shower gels. It smells incredible, just like key lime pie and it washes my body but feels moisturising at the same time. I don’t need to say much more about this body wash as you all know how much I love it and I’ve already repurchased another 3 bottles of this when they were on offer in Boots. I have also used up the Dirty Works Pore-fect Face Scrub from Sainsburys that I reviewed in full here many moons ago. This is an awakening scrub with a strong, almost minty feel to it. As I have been using this up I’ve found that it has become increasingly too strong for me and the scent makes my eyes water. I think that this is a problem with me rather than the scrub as it didn’t have the effect on me when I first started using it, I think I have just become more sensitive to products in recent months. I don’t think I would repurchase this scrub anymore and instead I will stick with some of the less invigorating, microdermabrasion ones that I have. The last product empty that I have to share with you is the Bioderma Sebium H20 Purifying Micelle Solution that I reviewed here. I have bought so many of these from Escentual as I tend to use this handy travel size when I go abroad to take my make up off. It is an absolutely fabulous product that removes my make up on a cotton pad or two depending on how heavy my make up is. Bioderma are one of my favourite French pharmacy brands and I would absolutely repurchase this cleansing water. What products have you used up recently? Which ones would you repurchase?